At 102dB efficiency, brute power was no requirement. Just so the PM-1 took an obligatory lap around my Aura Note Version 2. There a 125wpc ICEpower ASX board (250wpc into 4Ω) connects to a ¼” jack through just a load resistor. Talk about ultra-low Ω power. Even HifiMan’s HE-6 whips into shape to fly. Which often isn’t the case even when it plays loud enough. Playing musical chairs with my Bakoon AMP-12R and Stello HP100MkII and Questyle CMA800R loaners, I found the latter’s quicksilvery speed, incisiveness, ultra-wide bandwidth and close-up resolution the very best match. This meant the big system to get fronted by Metrum’s Hex converter in balanced mode and SOtM’s best two-box battery-powered USB bridge between it and my quad-core 27” iMac with PureMusic in 176.4kHz NOS-style upsampling + memory play etc mode. The Oppo clearly needed no help in the hung department. Hence no warm ballsy amp to emphasize its low end (with the current-mode Bakoon I was in civilized bass-head heaven). Like most planars aside from the HE-6, the top end though did benefit from my most lucid extended energetic amp. If we call Sennheiser’s HD800 the king of detail which particularly with its stock leash is nearly too fresh and crisp in the treble, the PM-1 played it mellower though not as dark as my v2 LCD-2. Whether this mellifluousness vis-à-vis the dynamic can was primarily due to Levitsky’s claim for far lower intermodulation distortion; more an actual response difference; or both I couldn’t say. I’d be inclined to agree with the man only because the vast majority of orthos I’ve heard share this more organic ‘creamy’ quality. It seems near endemic to the breed starting with its current tribal elder of Fostex (historically I’m told Wharfedale were the first to mint an ortho). Ribbon tweeters in speakers can have a metallic flavor. But I’ve never yet met it in planar-magnetic ‘phones. In fact those can be played unreasonably loud before irritating. That suggests very low distortion to again give credence to the IMD claim. I’ve often wondered though how an ortho’s motor system—which here is claimed to drive the entire membrane evenly—isn’t in the way between driver and ear. 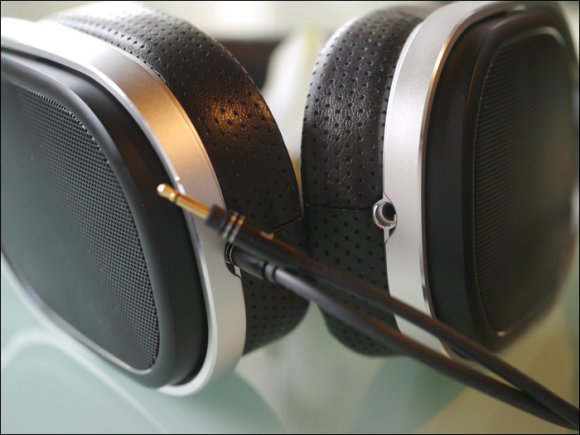 With a single-ended design like HifiMan’s HE-560, this barrier can be put on the other side. Away from the ear. But with a design using dual-sided drive one wonders. By way of comb filtering and internal reflections, is some of that in-the-way-ness responsible for the generally slightly diffusive presentation as well? I’d have to leave that to the engineers too. What matters to us is the subjective impression. Here the Oppo was a smoothie – all peaches ‘n’ cream without any citric acid. I’d side with those who for easy reference park it between an Audeze 2 and 3. In the bass it lacks the former’s slightly elephantine wow factor to be the more correct on amplitude. On weight meanwhile if driven by a proper amp it outdoes the 3. On relative treble light the 2 sits in the Oppo’s shadow, the 3 would seem about even. None of these however match the Sennheiser’s top. But then the HD800 can’t compete against their bass power unless one spent extreme cash on a Crayon Audio CHA-1. That Austrian über amp had the Senns perform as I’d not heard them before or have since. On subjective detail, spikiness (think long nails tapping on a glass table) will often suggest more detail. When an oud player like Adnan Joubran rips into his strings, one deals with real zingers. Despite their reputation for light-as-air responsiveness, planars like the PM-1 deliver the necessary quickness without the sizzle. To be sure, such sizzle relies on extreme close mic’ing. That’s a very unnatural perspective. But if recorded at such pornographic proximity, one does expect things to get wiry and nearly glassy, with plenty of edge and bared metal and harmonic spray. A dynamic speaker like EngimAcoustics’ Mythology M1 with its big dome tweeter and additional self-biased ribbon tweeter which I had in concurrently recovers more of that. Sacrificing it seems to be the price to pay for the PM-1’s civilized smoothness. If as a result you find yourself turning up the wick, that quality won’t kick in. Hence you’re quite liable to go beyond healthy levels without noticing. That’s potentially troublesome for your ears but not Oppo’s fault. Simply be aware. Another effect or aspect of this presentational style is its degree of separation and distinctiveness. Part of Oppo’s organic reading is a cohesion which enfolds rather than separates. If you fancy ultimate soundstage layering as well as headphones can do it, these won’t quite get you there. By the same token, the ability of an album to become maximally distinctive versus another—to reveal its unique fingerprint if you will—is a bit reduced. Things will sound more rather than less similar. On raw resolution where the ability to differentiate is maximized, the PM-1 is no extremist. Sennheiser’s HD800 would make for a better mastering tool. For pleasure listening however I consider it far more finicky about just the right amplifier than any planar I’ve yet met (HE-6 excepted again because of its raw drive demands). Because the distance between the HD800 driven off the wildly expensive Crayon versus everything else was so pronounced to let me know how much it usually leaves unsaid, I’d much rather listen to a planar. That’s bound to please every day of the week even with a regular amp. So much for the general lay of planar land as I hear it. Let’s do specifics. Audeze LCD-XC vs. PM-1. Three immediately apparent differences concerned space, overall feel and center of gravity. 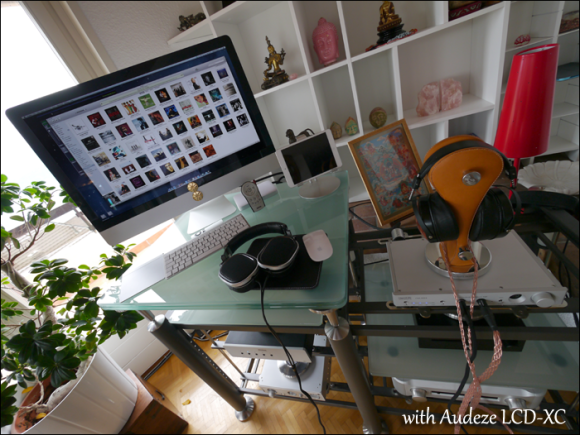 The Audeze sounded dimensionally bigger; texturally more redolent and elastic as though my head space’s reverb time had increased; and warmer. The Oppo played it more compact, damped and cooler. 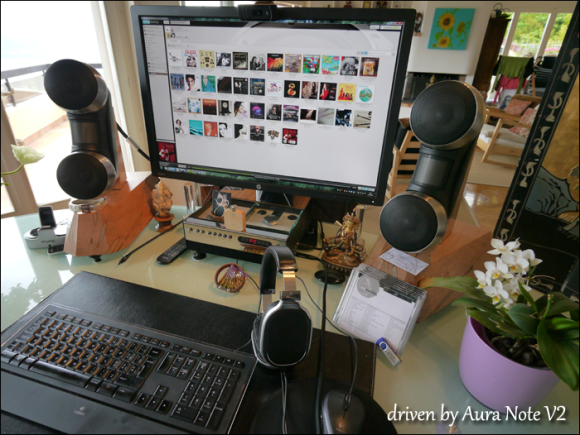 Having lived with Audeze as my favoured cans for a few years, I recognize the house sound. But inherent in that recognition must be a clear deviation from neutrality or else it wouldn’t be so easily detected. By that token the PM-1 struck me as the more neutral and even-handed if also less generous and voluptuous. The LCD-XC’s center of gravity sat lower too. This did not concern the low bass. Here I found both quite comparable. This impression rooted in the lower mids where the Audeze has an emphasis to downshift perceived tonal balance. If you fancy single-ended tube sound because you find its decays to linger longer, the LCD would have your vote. If you favor transistors for their higher damping, you’d go Oppo. Where this characterization fails badly? Compared to actual transistor vs. tube sound, I’d categorize both as – well, categorically tube. That’s because elevated 2nd-order harmonic distortion has a very similar softening/smoothing effect to these planars. Here we remember an earlier quoted reviewer. He said that with the Oppo, even his solid-state Burson sounded like tubes. Quite. That’s particularly so because Burson have always voiced their transistor gear for tonal density, not transient-centric zip. It’s within that sonic school of general tubulosity that Audeze suggest a zero NFB circuit, Oppo global negative feedback for a drier but also more linear sound. On wear comfort the Audeze is a clunky motorcycle boot, the Oppo a stylish Italian loafer. That said, big ears will find Oppo’s oval opening a bit small. 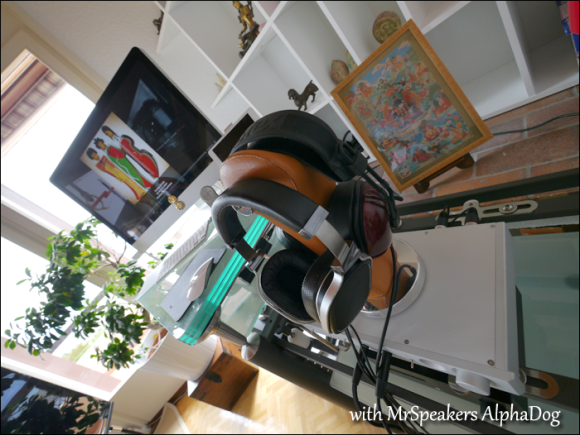 MrSpeakers™ AlphaDog vs. PM-1. I’d previously tapped the AlphaDog as a half-priced LCD-2 of slightly lesser sophistication. In that light it won’t surprise if where the Oppo dominated was on the same counts as the above paragraph albeit to a greater extent. On perceived raw resolution and linearity it had more. On redolence and tonal saturation the dog caught the bone. 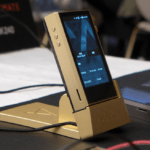 As a consequence, the AlphaDog on a warmer amp like my Eximus DP-1 (or its Stello stand-in from the same maker) would slide down to beta or theta status. Its innate warmth + amp warmth would get too humid, fuzzy and echo-y. For the rebuilt Fostex by Dan Clark, Alden Zhao’s Chinese Questyle amp was the even more idealized partner—vinegar and salt to its sugar—than it was for the Oppo. Putting this different, if you want to arrive ‘in the middle’ for a mostly neutral performance, Oppo require less compensation from your amp than MrSpeakers. On wear comfort, the AlphaDog is probably the most comfortable headphone in my collection. Because of its super-plush pads and bigger openings, I’d actually give it the nod. That’s no mark against the PM-1. It’s one cushy ride. For my head and ear size, the Alpha is simply even mo’ so. 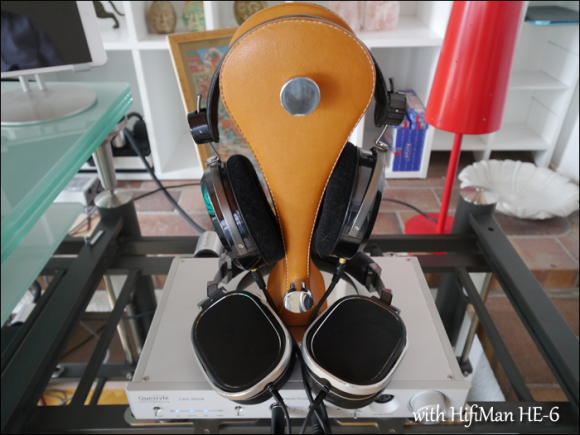 HifiMan HE-6 vs. PM-1. The usual boiler print applies. Unless you had just the right amp—easier said than done–you’d never tap this HifiMan’s full potential. In 8 out of 10 cases, Oppo would win this match by default. Needless to say, the CMA800R did a proper job with both. In my view the HE-6 is the yin to the yang of Audeze. It has the most brilliant top end but doesn’t match the Californian’s low-end slam or mass. This treble distinction obviously extended to the Oppo as did the other extreme. The HE-6 couldn’t match the PM-1’s substance or impact in the bass; the PM-1 couldn’t equal the HE-6’s upper registers. At least for me the more relevant distinction actually was elasticity. If the house sound of Audeze has the longest RT60—technically that’s the time it takes for sound in a space to attenuate by 60dB, here it’s simply meant as a general pointer at reverb behaviour–the HE-6 had the shortest. The Oppo slotted itself right between. The HifiMan applied the most damping to also dry out the sound the most. Seeing how I find the primary allure of planars this very quality of elasticity, elegant fade-outs and textural wetness, you know exactly why I’ve never really warmed to the HE-6. The new HE-560 in that stable makes an about-turn. Mine got simply recalled for two final production fixes before I could get serious. On organic sophistication as the reason why people continue to buy Kondo gear despite it being a technical atavism, the HE-6 had the least of that tacit quality. The PM-1 had rather more, the LCD-XC even more, my older LCD-2 the most. On subjective neutrality I’d stand that sequence on its head. Which gets us at the real world of practicality and having to work most universally to not make any special diva demands. Here an HE-6 doesn’t even make the list on raw efficiency; and all the Audeze fall off for weight and size. This only leaves the AlphaDog and PM-1. Between those two the Oppo is the more advanced on magnification power and the most compatible with mobile devices. The dog simply is a real pup on price. Moving back to my desktop where my Qobuz Hifi subscription nets me 24/7 FLAC streaming, Simon Lee’s cunningly voiced Aura Note V2 which dares to leash potent class D ICEpower amps to headphones (zero noise!) caused the PM-1’s performances to devolve. Now it sounded thicker and more congealed and congested; a bit more AphaDog. That’s an important reminder. For all its easy rider appeal, Oppo’s own flavor favors a very wide-bandwidth fast amp to act as minor grease-cutting agent for increased separation and distinction which prevents the sounds from ‘sticking’ to the background. This also gets the best from its powerful extended bass. Of course if you wanted more chocolate and less cayenne, Burson would be a most excellent stop. Then actual valves could be your final destination à la Studio Six, Balancing Act or Liquid Fire. Conclusion. Its awesome fit, finish and low weight as a combined value relegate Oppo’s planar competition to second tier. Ease of drive makes the PM-1 king of the kill to be all downhill from there in more ways than one. Narrowish oval not round pads make for a less than full-size proposition. Relative lack of breathing space for your pink bits means sweating over prolonged use gets more likely. Clamp pressure for my big noggin was spot on. Another shout-out is due for the mini-plug cable terminations and pad mounting scheme. Handling the PM-1 rubs in how despite being a maiden product in its category, its maker had both the resources and required diligence to cover the lot with such aplomb. It clearly was fortuitous for Oppo and their lead engineer Igor Levitsky to cross paths when they did. Oppo stumbled upon prior work done by his European research team; he tapped into a huge existing manufacturing and retail infrastructure to dwarf that of most hifi companies from the word ‘go’. The only ‘frustrating’ bit of business to handle today? That would be admitting that the perfect headphone doesn’t exist. Perhaps Sennheiser’s Orpheus was perfection. I simply never wore it. In the here and now and for a production headphone that’s not crazy money like the Abyss, I haven’t yet met one which compared to something else didn’t come in a slow second somewhere. In my ideal world I’d take weight and ease of drive of the PM-1; size and comfort of the AlphaDog; aural saturation, weightiness and elasticity of the LCD-XC; precision, treble elucidation and lateral scale of the HD800; and the luxo build and material finesse of the Oppo. But that’s an adolescent daydreaming of his perfect super hero. What powers should he have? There’s no doubt that planars not only do it differently, they sound it too. Here Oppo slot in right amongst the established best of breed. They still have their own flavor but the general ortho thing dominates. The biggest advantage the PM-1 introduces is its 102dB/32Ω sensitivity rating. That becomes the great equalizer and door opener. Minus the (well-deserved but self-congratulatory) hype and imbalanced pricing between Europe and the US, team Oppo have aced their debut headphones with real panache! As one who pointed out the price hike in UK, it’s half good to read this (on Head-Fi). Isn’t stopping UK dealers still selling at high price though! “For all those chomping at the bit for the PM-1 but were hesitant because of the International price discrepancy, we have updated our Offline Order Form to include the PM-1 and HA-1 products. This form will allow you to purchase any of our products direct and have them shipped internationally. That’s good information to have. Thx, Chris!